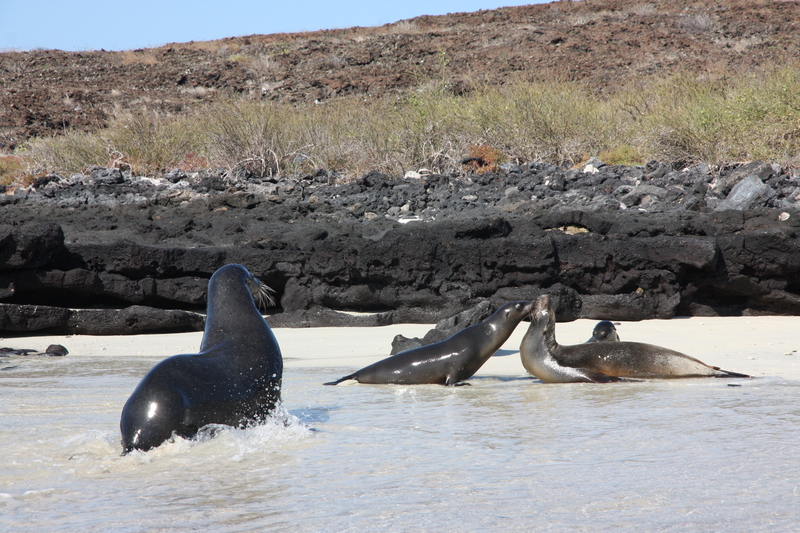 Meet the sea lions of the Galapagos Islands | Where to next? We’ve just had five glorious days in the Galapagos Islands, 1000 kilometres off the coast of Ecuador. It was hard to decide where to start with my tales of this amazing archipelago, but I figure cute and cuddly will be popular and welcome. 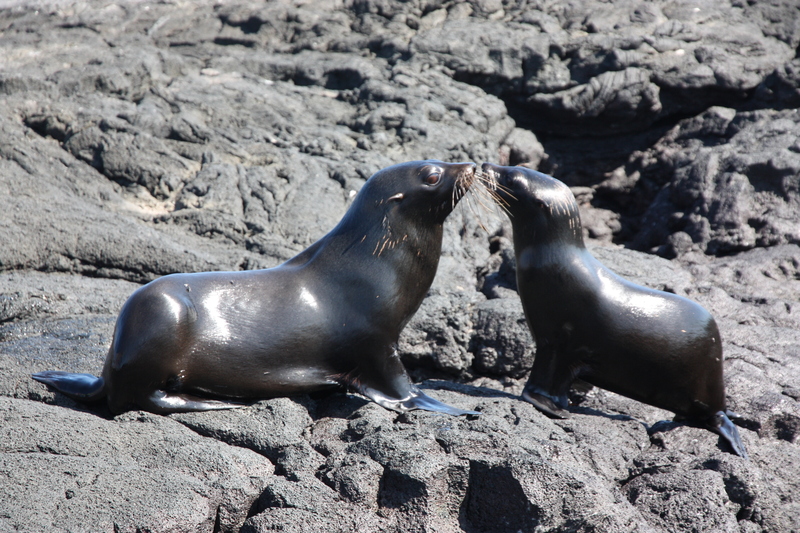 So meet the Galapagos sea lions—lobos marinos in Spanish—who have cute in trumps. 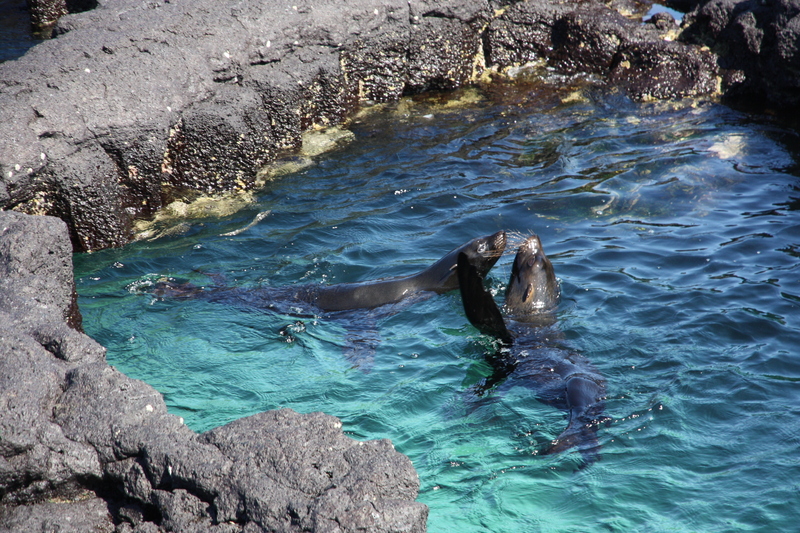 These social and playful creatures appear on almost all the islands in the Galapagos. There are anywhere from 20,000 to 50,000 of them lounging around on the sandy beaches or romping in the waters in this far flung part of the world. Play time all the time. We saw lots of them up close, really close, although never quite managed to touch one. Three of them were bunched together on the landing when we got off the boat at one island. Several times they swam with and around us as we were snorkeling. When we walked along the beach and someone yelled ‘look out,’ they were usually warning us not to step on or trip over a sea lion. Of course they are all protected so they aren’t really afraid of humans. We could walk right up to them and around them, lean over them with a camera waving in their faces, follow them along the beach or across the rocks (they prefer sand). So how about some more detail. 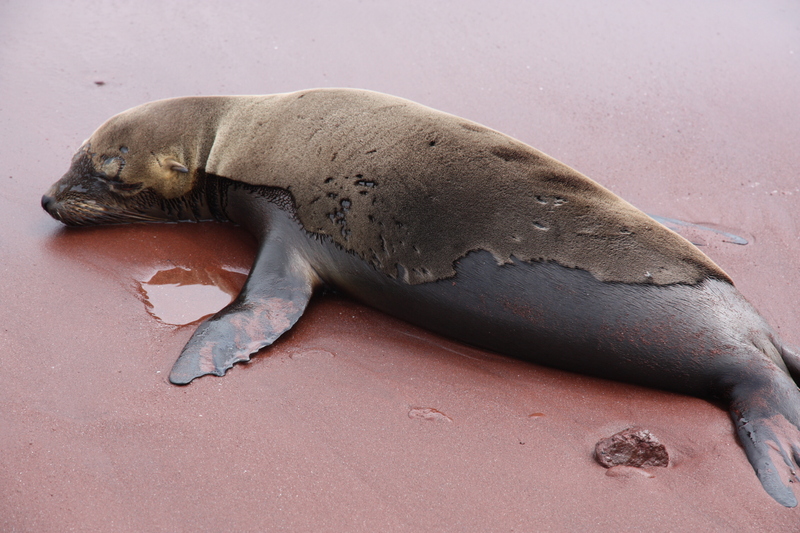 Galapagos sea lions have been thought to be related to the California sea lions, but recent genetic data indicates they may be their own species—Zalophus wollebaeki. The males and females have pointy, whiskered noses, obvious ear-like flaps and flippers (with claws that resemble toenails). They look a bit awkward when they walk on land, but oh boy can they swim. They are so agile—twisting and turning, leaping out of the water, zipping back and forth. It really is hard to keep tabs on their antics and whereabouts. Sea lions feed mainly on sardines. When times are tough (during el Niño events) they swim far off shore where they may fall prey to their main predators—sharks and killer whales. When sea lions are wet, they’re a dark chocolate brown. When dry, they are many shades of brown and gold. Sea lions live in colonies. A single dominant bull (they grow up to two metres in length) guards and protects his harem of five to 25 cows. His job lasts only a few months. He’s so busy protecting he doesn’t have time to feed, so is soon overcome by a well-fed fellow. Bachelor bulls usually live peacefully in their own colonies, waiting for a chance to take charge. Breeding occurs May to January, so there are almost always pups in a harem. We saw pups, but tried to keep our distance in case mum was nervous. ‘Dad’ gives up barking for a minute to rejoin the family on the beach? 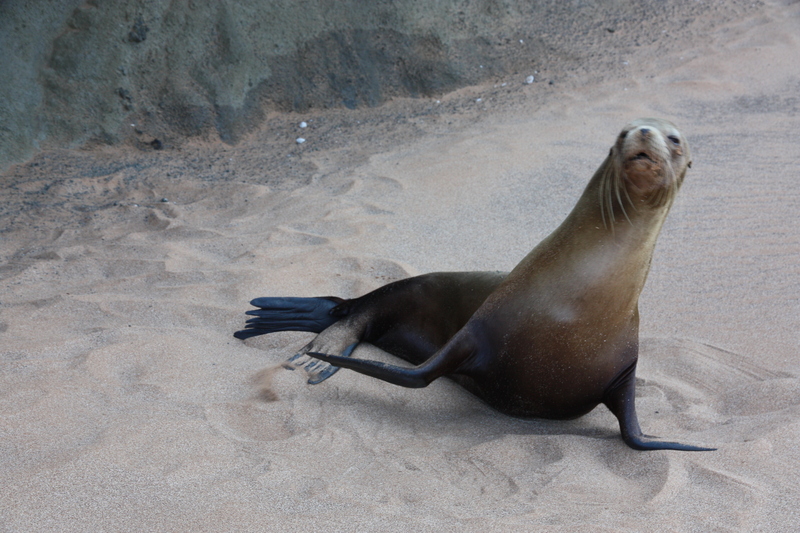 Sea lions are pretty noisy, especially the males. Their bark sounds quite dog-like and the males can bark on and on and on. We saw and heard one do exactly that on the last full day we had on the archipelago. If our guide was right, a female had just rejected the advances of a male. He let us all know how irritated he was, barking all the way to the water and then for the next 30–40 minutes while he sat in the water and we explored one side of the island. He might still be barking, but two pups returned to shore and he waddled in to greet them. A family reunion? Stay tuned for more on the Galapagos turtles, tortoises, lizards, iguanas, crabs, lava, flora, the boat we travelled on, and the beautiful and diverse land and seascapes. Oh Peggy, that looks wonderful. Such cute animals. I can’t wait to see more. Did you stay on the island or is the Galapagos protected? What a fantastic photo opportunity! Thank you. The sea lions are incredibly cute. We didn’t stay on any of the islands, but slept on the boat. Maybe I’ll introduce the boat next. From cute to ugly—meet marine iguanas « Where to next? Being crabby in the Galapagos « Where to next?